Welcome to Canberra Slotcar Club. 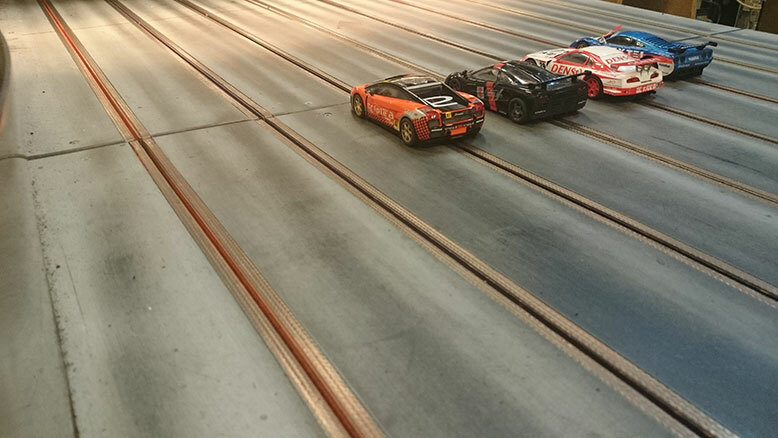 The rules of the Canberra Slotcar Club ‘CSC’ have been written with the emphasis of having fun, socialising and friendly competition for its members. These rules have been developed over time and have been fine tuned to suit the home club racing scene. As such, the senior members of CSC do not expect that there should be any need/requirement for change or review on a regular basis of these rules and as such, will be reviewed (by the CSC Senior members) but will not be up for annual discussion. Members are expected to apply a common-sense approach to interpreting and applying these rules, and at all times to act within the spirit of rules designed for friendly, fair and competitive racing. If in doubt as to whether the rules cover a particular issue, ask a senior member. It is the responsibility of each member to read the rules and comply with them. Clarification of the rules may be sought at any time before race night but not just before the race is due to start. If the rules do not cover a specific aspect do not assume that, if it’s not in the rules you can do it! Please seek clarification. It is usually best to seek the agreement of the senior members before racing a car which, although it may technically meet the Club specifications, might confer an unfair advantage on the relevant driver. This will sometimes be the case where a manufacturer issues a new model or upgrades the motor or running gear on an existing model. As new models become available they will be assessed regarding their performance but CSC maintains the rule that the body and chassis must be made of plastic or resin. New release cars will not be eligible to race as they become available until the model's performance has been ascertained by the senior members. Class allocation will be on the basis of performance. The major objective of the CSC meetings is that all members have a pleasant social meeting with a small mix of competition for its members. Members and their guests are reminded that we are guests in each other’s homes and accordingly respect should be shown to both the host, their guests and their property. Any members who do not respect the host, their guests or their property will firmly, but not severely, be slapped up the back of the head and then politely asked to leave. While guests are more than welcome at any race meeting, as a common courtesy, the senior members must be asked prior to the night. Guests must be accompanied by a member to a club meeting and as a courtesy should be properly introduced to the host and CSC members immediately on arrival. Both the host and senior members have the right to ask members guests to leave if protocol has not been adhered to or if they feel uncomfortable. Membership is strictly by invitation only and must be put forward to all active senior members. Membership is non-financial so members do not incur an annual membership fee. Members are required to pay a $5 fee at each meeting. Guests at race meetings are welcome, however guest may only compete in racing if they pay $5 entry fee. Paying guests may purchase raffle tickets. The track owner is not required to pay race fees. All members and guests in attendance at a race meeting must assist with marshalling. Where a multiple car pile-up does occur, the instigator of the crash will usually be put back on after any innocent parties car has been returned to the track. However as this is not always cut and dry, it is the marshal's sole call on the order in which cars are returned to their respective lanes. As in all things, common sense should always prevail. Please remember to be polite to marshals at all times. Inevitably, marshals will sometimes be distracted though they always endeavour to put cars back on track as soon as possible. Club meetings are meant to be fun and the competitive side of racing should not be at the expense of good manners or all present having an enjoyable evening. Rude or aggressive behaviour spoils it for everyone and is unacceptable. Approved Manufacturers - Scalextric, Sideways, Racer, Slot It, Revell, SCX, Ninco, Fly Car, GB, Carrera, Pro Slot, Pioneer, MRRC, Team Slot, Spirit, and Scale Auto. Cars from other mass-production manufacturers may be raced, providing the performance of each model has been assessed and an appropriate classification agreed. Box Standard – All classes to be box standard unless otherwise stated in these rules or classes. Approved Replacement Parts - Parts sold for this purpose from the approved manufacturers. Unless otherwise noted approved replacement parts for a particular car must be sourced only from the manufacturer of that car. Approved Repairs - Where approved replacement parts are unavailable, repairs may be carried out using materials only of a similar weight, material and construction. Chassis – Chassis and body combinations must be as per the original specification of the vehicle unless otherwise specified in the classes. Braid and Guides – In all Racing Classes the type of braid used in the guide blade is optional. Guide blade spacers may be used. Guide blades from the approved manufacturers may be used as replacements for original items in all classes of racing. Pinion and Crown Gears - Standard size pinion and crown gears from the approved manufacturers may be used as replacements for original items in all classes of racing. Metal gears are not permitted in any vehicle in any class unless they are standard fittings (such as Slot.It) with the exception of replacing metal pinion gears for plastic gears. Gears and gear ratios must be as per manufacturers specifications originally fitted. Lights - Need not be in working condition, but no part of the lighting system may be removed. Wheel bearings - Only approved manufacturer’s bearings acceptable. Bearings may be glued in. Wheels – Wheels must not protrude outside the bodywork unless box standard. Metal wheels are not permitted unless that class has metal rims as box standard (such as Slot.it). Tyres – Tyres must be either manufactures standard (tyres can be mixed between manufacturers, e.g. Ninco tyres can be fitted to an SCX car) or MJK’s. Tyres may be sanded or cleaned prior to the start of any heat providing this does not unduly delay the start. Use of ‘tyre treatments’ other than thinners, WD 40 or spit is not permitted. Silicon tyres are prohibited. Magnets - To be removed for all classes. Weighting of Cars – In all classes, except Vintage F1, cars may carry ballast. This may be placed inside the body or under the chassis. In the latter case, care should be taken not to make contact with the track and applying electrical tape to ensure no shorts to the owners track is mandatory. Motors – Except where otherwise stated, swapping motors is permissible as long as it’s 'like for like', for example a Mabuchi for a Mabuchi but not an SCX for a Mabuchi. Whole or partial exceptions to the 'like for like' rule occur in the ‘Ninco Classic’, ‘Slot-it’ and ‘Classic Le Mans’ classes. Motors may not be tweaked and must remain box standard. Motors may be glued, while the brass pickups may be soldered or wires soldered on to ensure electrical contact. Approved NC1 equivalent motors include: BWAC1, H&R Jack Rabbit and the MT1. Loss of Parts during Racing - Whilst cars are required to be complete at the commencement of racing, parts which fall off during the race, with the exception of wheels, need not be re-attached. Wheels must be replaced within one lap of the incident occurring otherwise the competitor will record a DNF.